Free Range Turkeys ever vigilant guards! 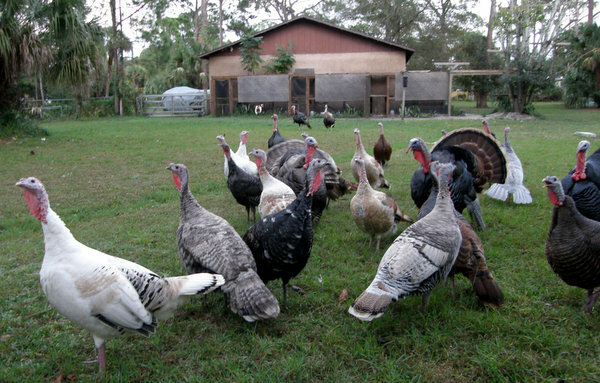 Our heritage turkeys and chickens are able to free range & graze all day; consequently turkeys have to be vigilant for fur or feathered threats. Luckily the turkeys are particularly well adapted to spot avian predators. With their eyes located on opposite sides of their head, turkeys are able to look at two objects at once and by quickly twisting their long necks they can obtain a 360-degree field of view scanning the forest for threats. 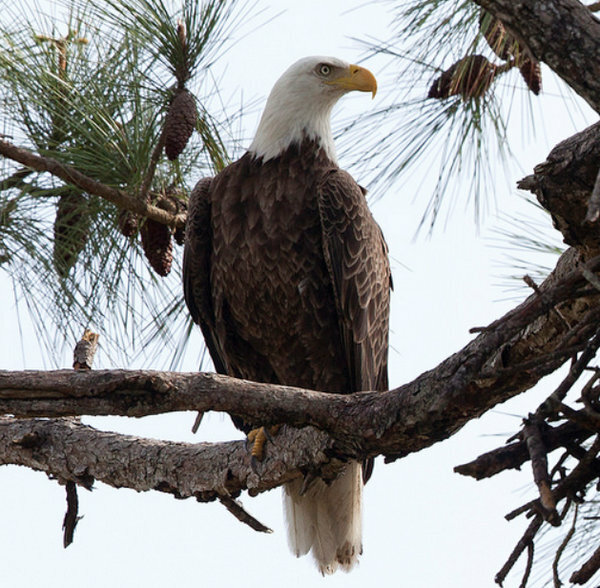 Here in east-central Florida the turkeys will often chirp (call) an alarm when sighting hawks, falcons, eagles, owls, harriers, snail-kites, ospreys and caracaras. Sudden appearances of cranes and herons will also spook the birds. Turkeys will sound an alarm call whenever they spy one of the winged hunters- no matter how high in the sky or far away. When the alarm is called, turkey hens will crouch with their tail feathers spread out in a low fan that breaks up their outline. 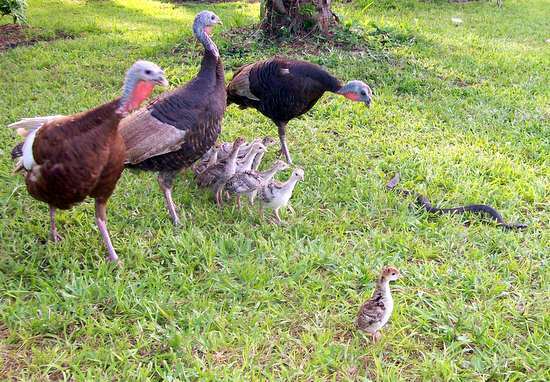 Young turkeys have an instinctive reaction to this warning call and their behavior is the same, whether they are one day or two months old: scatter to shelter and go “flat”! 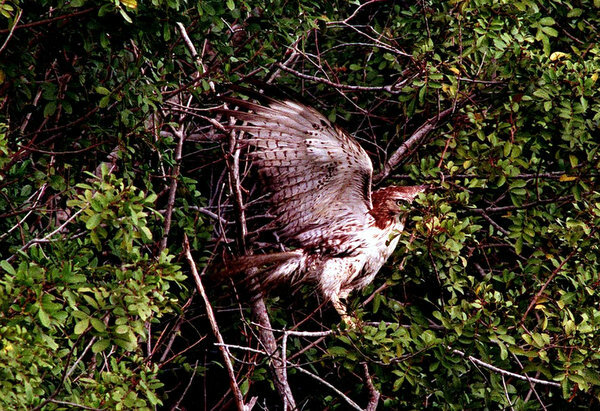 Occasionally on the turkey free range circuit, Red-shouldered hawks are able to get close to the hen and her chicks and dive on them for the kill. 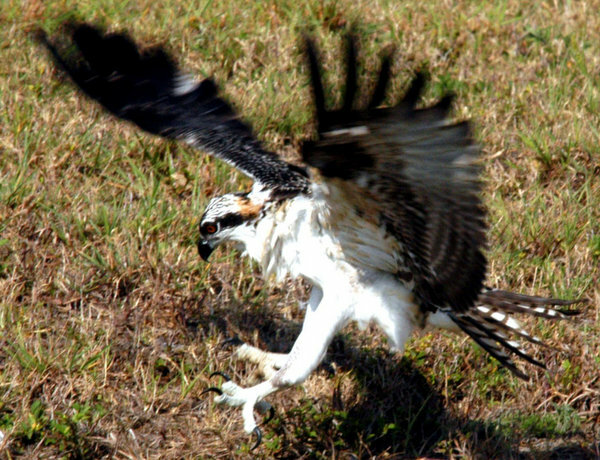 It is a very impressive sight, when the normally cautious turkey hen, spies the attacking raptor and takes flight to counter attack the hawk 10-20 feet from the ground. 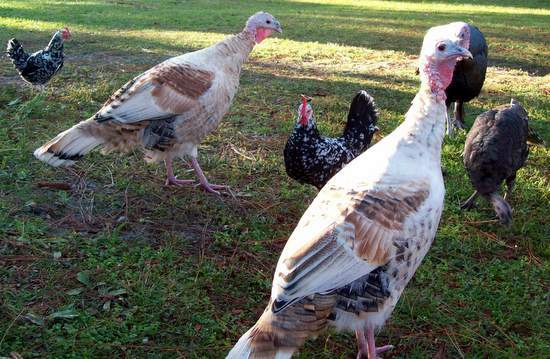 In our 12 years of raising turkeys, I have never seen a raptor successfully grab a poult from a protective turkey hen. Actually I am more wary of crows than hawks, because the intelligent crows have been known to use team work to steal the small birds. Other hunters inhabit the free range environment. 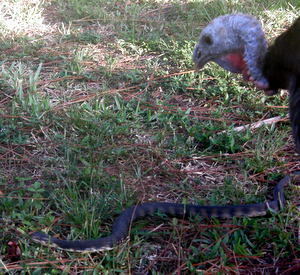 Turkeys have a special warning call, reserved for snakes, but they will also use their snake warning on turtles, alligators and occasionally toads and frogs. 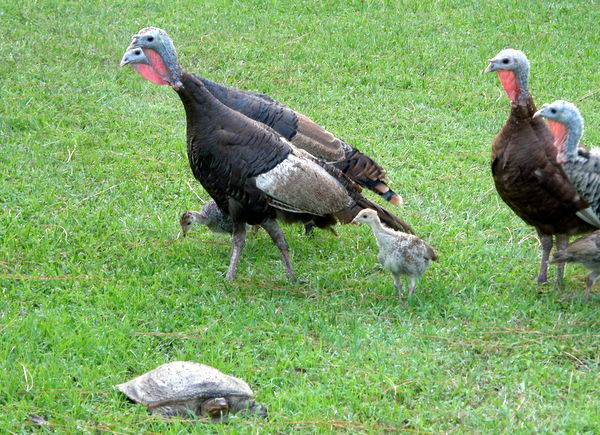 Turkeys like people share a fascination (bordering on fear) with reptiles and sometimes amphibians. 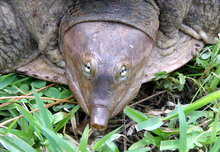 Once a snake is discovered, the “Snake call” alarm is sounded and those birds that within hearing range will quickly come to the call, surrounding the snake or hapless turtle. 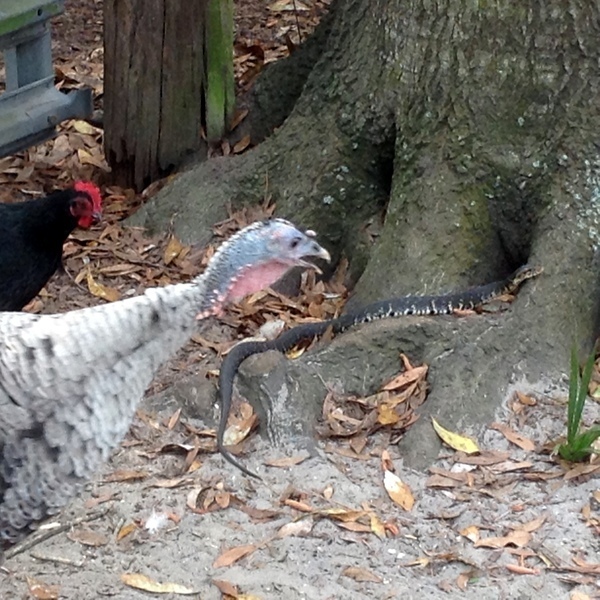 Turkeys even have a certain stance when surrounding a reptile that we call the “snake dance”. 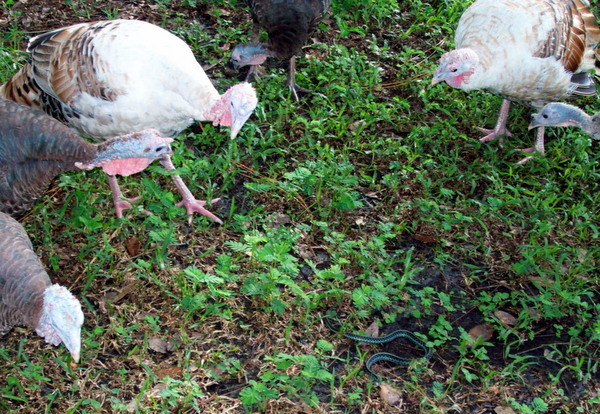 Who would have thought turkeys are fascinated with reptiles? 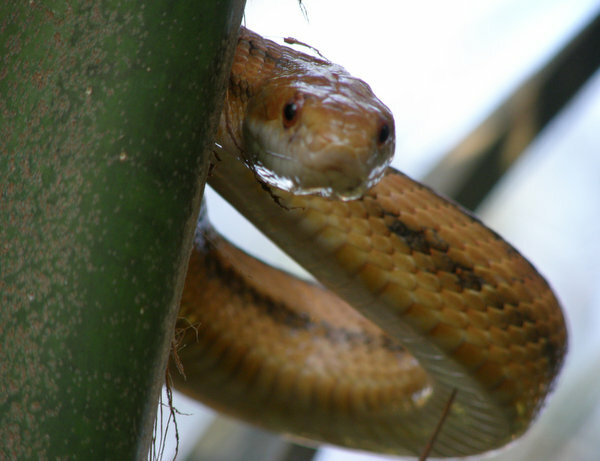 Upon hearing the snake call given or observing the snake dance or posture, investigate and remove snake from your property. 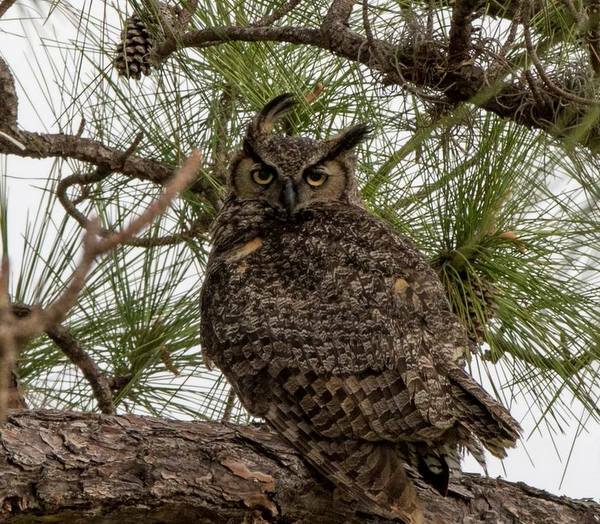 We personally have heard the snake call alarm and investigated to find the turkeys surrounding hard and soft shelled water turtles, box turtles and gopher tortoises. And of course a variety of snakes from Florida water snakes, Indigo and black snakes, glass lizards, pigmy rattlesnakes and once even a 4 foot long Eastern Diamondback Rattle snake. The majority of these reptiles were placed safely over the property fence. 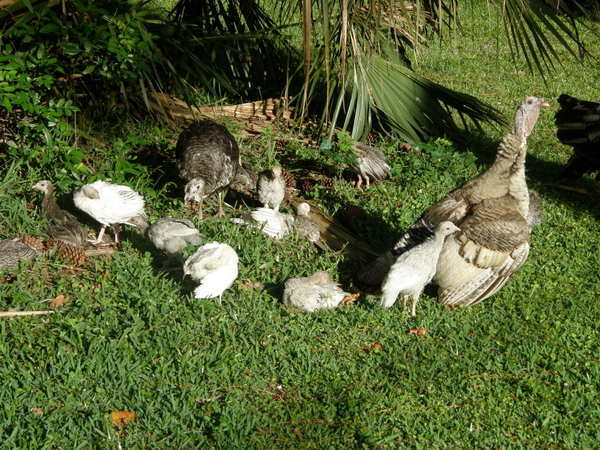 One of the more interesting observations about turkeys and their reptile fascination, is that their interest may be instinctive based upon the hens interaction with their poults around snakes. 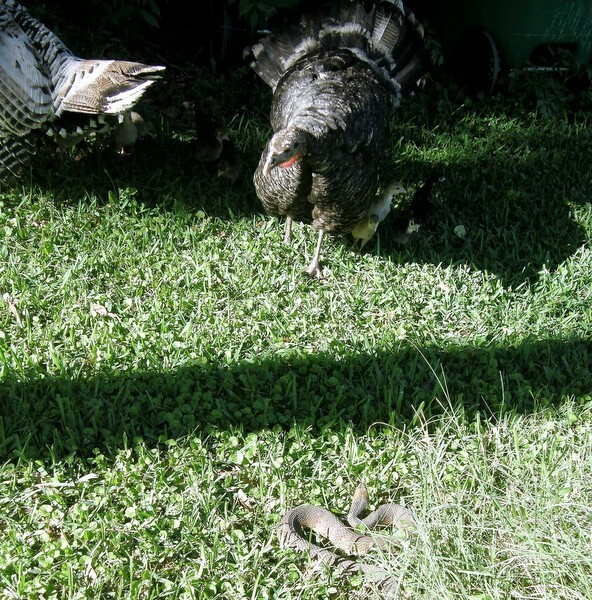 Even the youngest of turkeys will give off the snake call warning when spying a snake. These tiny chicks will also join in the snake circle chirping at the surrounded snake. Their snake caution is not a learned behavior, but apparently something in the birds hardwired to give off the snake alarm. The behavior only gets more interesting when the mother hen, instead of attacking the snake or turtle, begins to peck her chicks because they are too close to the reptile. 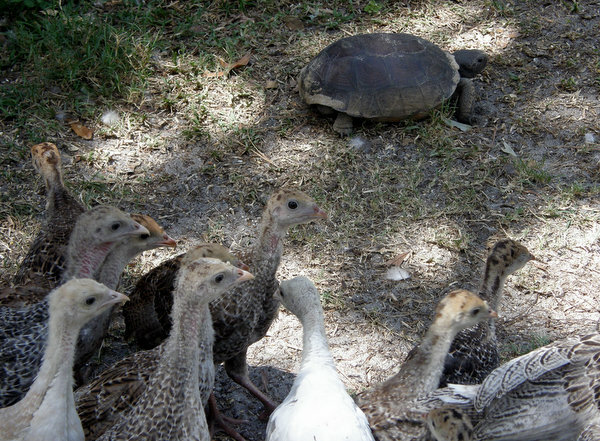 By observing turkey interaction with reptiles during their free range strolls, I have to wonder if human’s fascination and aversion of reptiles is also in some way triggered by some ancient instinct. New Picture added. 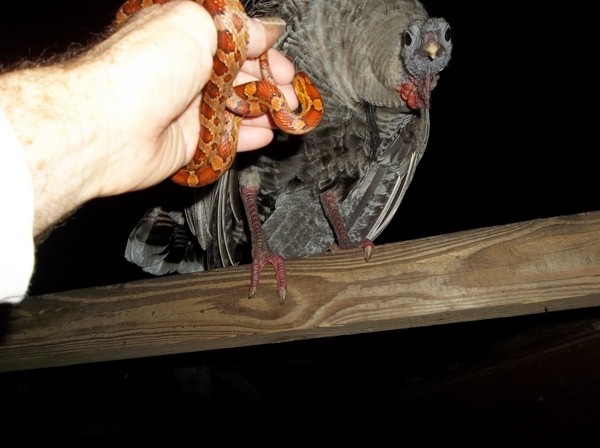 Butterball & a Florida Banded Water Snake. What can I say, welcome to Florida. 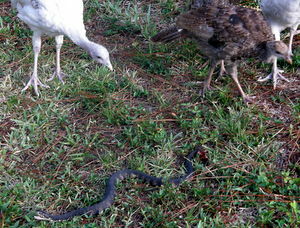 My page: Turkeys and Snakes: More turkey and snake interaction.